At 5am Monday, Seattle resident Jens Melin found a baby goat tied to a pole at a school near where he lives. "It was shaking and terrified." He said the rope was long enough that it could graze but since the owner reported that it hadn't yet been weaned, that probably wasn't helpful. 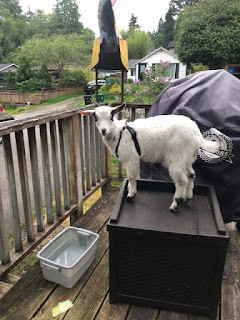 Jens took it home, put it on his deck, and started asking friends on Facebook what he should do with a goat. It didn't take long to discover our story. Jens tried to call the number provided but it was blocked. So he and the goat got in the car. "We only had the cross streets. When we got out to start knocking on doors the goat started yelling. The owner heard him and there was a satisfying reunion."